Love It, List It, or Still a Fixer-Upper? Housing is both an enormous driver of the U.S. economy and a strong cultural desire. The latter was reinforced during a recent institutional client visit to Waco, Texas, a city transformed by the power of the notion of “home.” The tremendous success of the TV show “Fixer Upper” prompted stars and entrepreneurs Chip and Joanna Gaines to convert an idle industrial property into a complex of home-themed stores under their Magnolia brand. The site now draws 30,000 visitors per week from across the country to Waco. The spillover benefits to the community are apparent in the form of redevelopment, revitalization, and new businesses. While the impact of housing isn’t quite so dramatic in every community, from any angle, the housing market is central to the U.S. economy. Housing-related economic activity represents approximately 15 percent of gross domestic product (GDP).1 As Figure One shows, the impact of housing goes well beyond the $288,500 cost of construction for a median home to include three jobs created, more than $280,000 of wages and profits, and more than $100,000 of government revenues. And at an individual level, the combination of home price appreciation and a strong stock market since the end of the Great Recession has driven household wealth to new record highs. Household wealth now represents approximately 700 percent of after-tax income—the highest level since at least 1952—and real estate represents approximately one-third of that wealth. In an economy where consumer spending accounts for more than 70 percent of economic activity, there is a direct link between how wealthy we feel and how likely we are to spend. Home equity also represents an important source of capital for entrepreneurs starting new businesses. As meaningful as these numbers are, there are also important nonfinancial benefits of home ownership that are often cited, such as pride of ownership, greater sense of community, and educational outcomes for children. But these benefits come at a cost. The costs of owning a home leave less disposable income for other budget categories such as recreation, travel, dining, and other experiences favored by younger generations. Given our increasingly nomadic workforce, the illiquid nature of housing and high transaction costs may reduce mobility for homeowners. And owning a home presents financial risks—either in the form of unexpected maintenance and repair costs or the risk of price depreciation. Given the central role that the housing market plays in our lives and our economy and as we pass the 10th anniversary of the global financial crisis—the federal takeover of Fannie Mae and Freddie Mac occurred in September 2008—we seek to assess the current state of the housing market and examine the future outlook. In 2016, home prices, as measured by the Case-Shiller Home Price Index, surpassed their prior peak attained in late 2006. Fueled by a strong economy, low mortgage rates, and rising wages, they have kept rising. By the summer of 2018, the index was more than 10 percent higher than its 2006 peak. As in 2006, home prices are higher than ever. But the difference is that this time home prices are better supported by comparable growth in consumer disposable income. As shown in Figure Two, home prices and disposable income tend to move in tandem. Viewed this way—and with the benefit of hindsight—the home price bubble of the mid-2000s is quite noticeable. Over the past few years, we have seen home prices once again grow faster than incomes, and in 2013 this valuation heuristic once again tripped into overvalued territory. Over the long term, home price growth should match income growth, suggesting that future home prices could grow more slowly—or even decline—to close the gap. Of course, predicting future home price trends is not quite that simple. For one, the data shown above reflects data from across the country, but there isn’t really a “national” housing market. 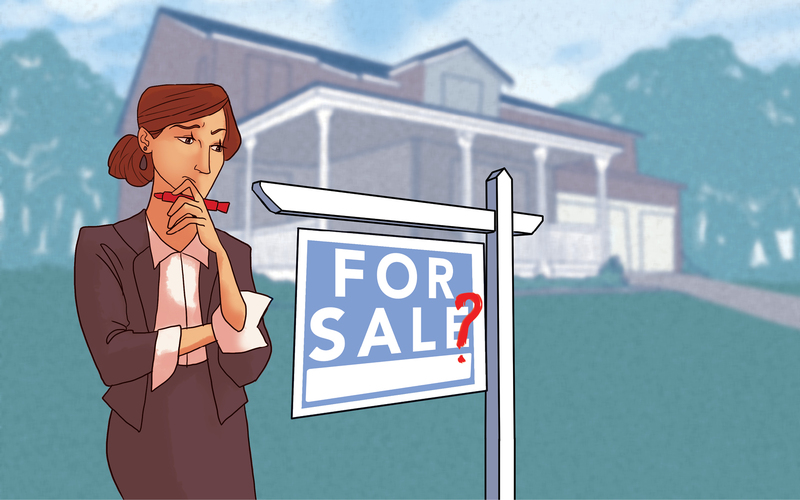 A buyer seeking a new home in Springfield is unlikely to compare homes in Massachusetts, Illinois, Missouri, Oregon, and the other 21 states with a town by that name. Real estate markets are local, and price trends vary considerably from one region or metropolitan area to another. Housing data analytics firm CoreLogic categorizes home prices in individual markets as undervalued, at value, or overvalued by comparing home prices to their long-run, sustainable levels according to local market fundamentals such as disposable income. Of the 100 largest metropolitan areas, the firm estimates that 38 were overvalued, 19 were undervalued, and 43 were priced at fair value. As with any good or service, the price of housing is a function of supply and demand. Since 2011, the supply of homes for sale has been abnormally low and shrinking, even as the U.S. population has steadily grown. As Figure Three demonstrates, inventories of new and existing homes for sale around the U.S. have declined for the last five years and are well below the six-month threshold that is considered a balanced market supply. The supply of homes for sale is low for two primary reasons. Existing homeowners have less incentive to sell their homes, and new home construction has not kept up with demand. Many existing homeowners are effectively handcuffed to their homes via exceptionally low mortgage rates obtained via a purchase or refinance over the past decade. As mortgage rates increase, it becomes more expensive (on a monthly payment basis) to replace a home of the same value. Unless compelled to move for other reasons, buyers would need to find a home with better attributes or location to make a move. But with inventories of existing homes for sale decreasing, there are fewer homes to choose from. On the demand side of the equation, the key factors at play are home affordability, competition to homeownership (e.g., renting), and consumer preferences. Homes today remain affordable by historical standards, but with rising prices and mortgage rates, they are becoming less so. Changing consumer preferences may also play a role. The tidy home in the suburbs with a white picket fence may not hold the same appeal to younger generations who would prefer to live in city centers. This appears particularly true of millennials who came of age during the Great Recession, perhaps witnessing the strains and stresses of the housing market collapse on their parents. Other reasons often cited for delayed household formation in younger generations are that they tend to live at home longer, delay marriage, and carry higher levels of education debt. Alongside the soaring price appreciation that fueled widespread speculation in real estate, another significant contributor to the financial crisis was easy mortgage lending standards. In the boom years prior to 2006, lenders often lent to buyers with no down payment, poor credit, or unstable employment. The use of riskier mortgage products, such as subprime, adjustable-rate, and interest-only loans also increased. The bundling and securitization of these loans into mortgage-backed securities kept money flowing back into the system. In the past decade, the mortgage lending environment has changed considerably. As anyone who has gone through the process will note, it is much harder to get a mortgage today than it was in the early 2000s. We have seen borrower credit scores at origination increase by approximately 50 points relative to prerecession levels—to an average score of 755, according to housing data analytics firm CoreLogic. Mortgage bundling and securitization is still occurring, but the qualified mortgage provision of the 2010 Dodd-Frank reform bill has served to increase the quality of securitized loans. In 2018, cracks in the housing market began to emerge. In September, new home price appreciation was flat year over year for the first time since 2012. This tempering of the pace of price appreciation is understandable as levels of consumer income catch up to home prices. Nonetheless, there are several tailwinds at the back of the housing market, including low unemployment, rising wages, and unsatisfied demand for housing. Unlike 2007, builders have not saturated the market with supply. Homeownership rates for all age groups remain lower than the levels seen prior to the Great Recession, particularly for younger age groups. Potential homebuyers who have been sidelined by rising home prices, rising mortgage rates, and low inventory would welcome a shift away from a seller’s market toward a buyer’s market. In December, Redfin reported that the year-over-year growth in homes for sale had hit a three-year high, perhaps tilting the supply/demand scales back toward the buyer. Although the cap on the deductibility of state and local property taxes introduced by the Tax Cuts and Jobs Act of 2017 could be a contributor to price stagnation or even regional home price recessions in higher-tax regions, buyers of lower-priced homes will continue to enjoy full deduction of taxes and mortgage interest. Considering the overall balance of headwinds and tailwinds, we expect the housing market to be a neutral to slightly negative influence on the U.S. economy over the next few years. Although the bloom may be off the rose as an investment—particularly for those affected by the tax law change—home prices remain affordable in historical terms. There is still energy in the housing market, and the nonfinancial benefits of homeownership—evidenced by the long lines at Waco, Texas, cupcake shops in 100+ degree Texas heat—are as important as ever. 3 Fleming, Mark, “Why Homeowners Staying in their Homes Dampens the Housing Market,” First American, 2018. 4 Joint Center for Housing Studies of Harvard University, “The State of the Nation’s Housing 2018,” 2018. 5 Salviati, Chris, “Apartment List National Rent Report,” Apartmentlist.com, 2019.